The onus for having a coherent instructional system lies with the leadership of a school and with the leadership of the district. The System for Effective School Instruction (SESI) pulls together the Georgia School Performance Standards that are most relevant to assessment, curriculum and instruction and provides a model system intended for use by leaders and/or leadership teams in schools that do not have a system for instruction, or have a system that needs improvement. Do you have an instructional system? How do you define instructional system? The System for Effective School Instruction Self-Assessment Checklist is for school leaders to conduct a needs assessment of current instructional processes. Using the assessment data, schools will develop, implement, monitor, and support processes for their instructional system. 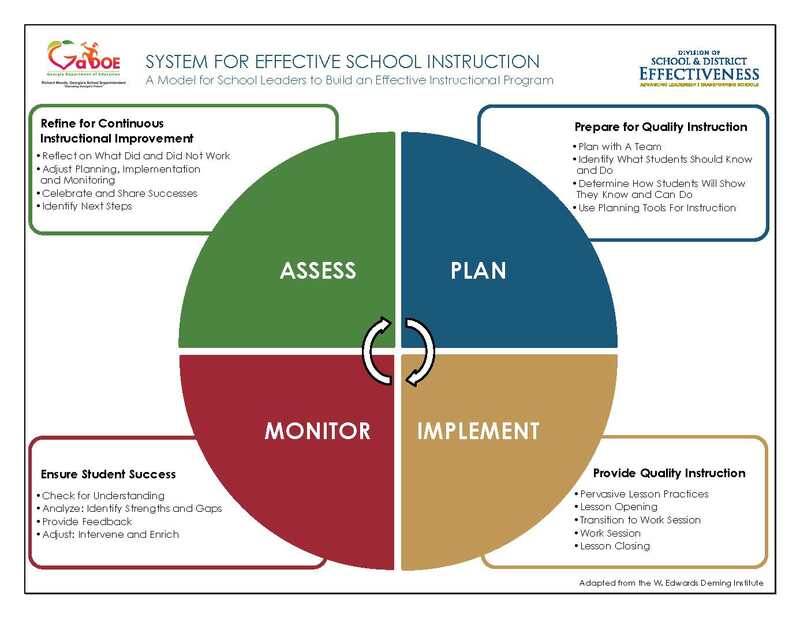 Click on the graphic to access the model instructional system in its entirety. We have taken all reasonable care to ensure that the information contained within these pages is accurate and up-to-date. We do not endorse any non-Georgia Department of Education websites or products contained within these pages or through external hyperlinks. This document contains only a sampling of available resources and in no way should be considered an exhaustive list of available resources. It is at the discretion of individual districts and schools to determine appropriate resources to serve stakeholders.